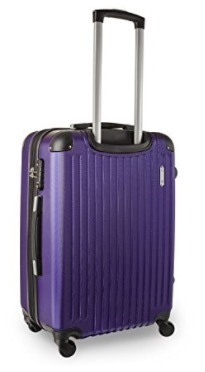 TravelCross Columbia is a three-piece hard shell but lightweight luggage set with the very smooth spinner wheels. They are designed for modern traveler’s different journey needs. You have nine colors to choose from, including the black, orange, white, silver, champagne, dark gray, dark blue, red and purple. The 3 pieces are made up of a 20-inch non-expandable cabin bag, a 24-inch and a large 28-inch expandable suitcases. The 20” carry-on bag weighs 5.6 pounds, measures 20 x 12 x 8.5 inches without wheels and meets the IATA standards for US cabin luggage restrictions. The medium 24” weighs 7.8 pounds and measures 24 x 16 x 10 inches and the largest suitcase weighs 10.6 pounds and measures 28 x 19.5 x 10 inches. They will be shipped as nested inside each other and you may also store them this way in your house. The shipping weight for all three is 25.2 pounds and the product measures 28 x 12 x 18 inches. They all come with the TSA locks that you can set your combination code on easily and the TSA staff at the airport can open your luggage for inspections without breaking the lock. And you also have the integrated OKOBAN which is a smart global “lost and found” solution with the great tracking feature. Okoban is connected to WorldTracer which is the airline tracking system used at more than 2800 airports globally and by more than 400 airlines. There is a unique ID code on the luggage and whoever finds it can go on okoban.com and report the found item easily. Your chances of finding your luggage are significantly enhanced by this system. They are made of hundred percent premium ABS material that makes them lightweight despite being super solid and durable with a very resistant hard shell. They also include hard guards in the corners for protection against potential damage, to improve performance and durability. TravelCross is a well-known brand in the luggage and bag industry, for reliable, great quality, sturdy, nice looking, sleek and modern products they offer to the market. All three sizes come with good quality spinner wheels that roll 360 degrees smoothly and quietly through the airport terminals and parking areas, with also the help of the comfy to hold telescoping handles that help you move the suitcases without too much effort. The 28” and 24” suitcases are not very big on the outside but are very spacious inside, with their expandable design. These are good quality suitcases and they will hold up well and look like new after many journeys but the checked in suitcases can get scratched. It is always better to have a hard case than fabric for your valuable or fragile items. Please note that it is made of lightweight ABS material so it is hardshell but flexes a little. The rubber underneath the side handles ensure a better grip when you wish to hold the suitcases horizontally. If you choose one of the non-black colors it will be easier to spot your suitcases in the luggage claim area at the airport. 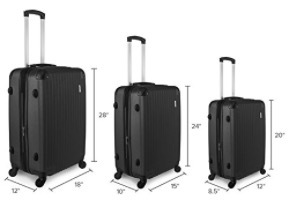 This is a very good value luggage set that could be compared to much more expensive sets. It is offered with three years of warranty for defects in manufacturing by TravelCross.